In all the places I've ever worked, Stack Overflow is frequently used by practically every developer there, and they have a positive experience in which they quickly find a good answer to the problem they're facing. Yet, I am the only person I personally know who even has an account. That's right, none of the developers I've worked with (about 100) has ever bothered to even sign up. Why is that? Why do so many people not consider signing up, let alone contributing? I suppose I'm wondering why people don't get a little rep (15) to be able to upvote to give a stronger indicator of which answer works plus as a thanks to the posters - to "give back" to the site. What are we doing wrong, or not doing? Or is this just "the way people are"? Do other people find the same level of apathy amongst your co-workers? Why do so many people not consider signing up, let alone contributing? Because most of them never need to. They have no reason to sign up. They can find the answers to the problems that they have by searching through questions already asked, and never need to ask new ones. What are we doing wrong, or not doing? We're not doing anything wrong. We're doing something very right. We're creating so much useful and accessible content that most developers never need to create an account to ask questions, they can find everything they need to know by searching through the existing knowledge base. What are we doing or not doing, that results in people not creating new accounts, we're doing everything possible to make sure that the useful content that is created when a question asked becomes available and easily accessible to everyone else in the entire world, instead of forcing (or encouraging) every single person that has the same problem to ask a new question. Most people I know are pretty scared of being publicly embarrassed or one-upped. @Servy is right that because Stack Overflow works so well at giving great answers to most users, there's little reward to compensate people for the social risk of exposure/humiliation that inherently accompanies contributions. I wouldn't call it apathy, necessarily. Oops... Sorry. Got carried away there. Some will ask a question without reading the Help Center, conclude we're just a bunch of grouchy in-types, and leave. Some will ask a good question. Those who contribute answers have both expert knowledge and the desire to contribute. There's a sweet spot between not knowing enough to contribute and being an expert in the field who is presumably too busy (or otherwise unmotivated) to contribute. The percentage of such people in that sweet spot is quite small, and the percentage of such people who contribute substantially is disproportionately smaller than that. If you look at the user accounts on Stack Overflow (half of them are rep 1), you should find that the level of participation at your workplace pretty much follows the same pattern (you might find one person in a workplace of 100 that is an active participant), for the same reasons that not everyone is a plumber or electrician, and not every plumber and electrician has a blog. I'm going to take the opposite stance of Servy's answer here. It reflects conversations I've had with close colleagues and coworkers when I bring up Stack Overflow. Most people don't consider signing up because they're terrified to. They have no willpower to sign up; although their question is not answered or they don't know of any other place to find an answer to their question, they are absolutely terrified of falling foul of the community. They've seen what happens to those poor, misguided souls that do dare to ask a question here that isn't up to snuff. As sad as it was, a friend of mine remarked that Stack Overflow has done a job of teaching developers not to ask questions on it. This may be due to the sheer volume of questions previously answered, or the tendency of the community to react as if someone put pineapple and sauerkraut on their pizza if a similar question is asked. They've got a point, though; a lot of developers that I know who have good questions are just really afraid of breaking any unforeseen taboo or violating any policy that may be present when others are monitoring the site. I've had a few people swear off the site because of the needless wave of, "What have you tried", or the senseless negativity because they didn't understand the predicament they were actually in. Those were the people trying to get help, and they thought that struggling through their problem would be better than asking. I hope to see some more of my friends and coworkers contribute to the site, but their fears are that what they know isn't applicable to the site as a whole, or is too archaic. I have a friend that has worked exclusively with Perl and FORTRAN for quite some time, and he's afraid that if he were to contribute here, his contributions wouldn't be valued so highly. I'm working with them on that; it's likely a confidence/typing/eloquence issue more than a community one, but I hope they can contribute here some day. I'll throw in my perspective. I'm not keen on asking a question here myself. Call me jaded, but it's either been asked here before, or I haven't expressed myself eloquently enough to get an answer or any acknowledgment of why I might be confused. This is why I ask so few questions; I know how some of those may be received. I can't really answer that. Rather, I'm not sure if I should be answering that, since it's a problem that's a lot deeper than a few twiddles of a knob can address. It boils down to molding a contributor into something ideal. The problem is, I'd say, no one has really defined what that ideal contributor is yet. Is it someone that does their research? Yes, absolutely. Is it someone that expressed themselves clearly? Sure. Are both of those things still subjective enough? Yes, since "research" and "clarity" are evaluated on a case-by-case basis, and not by the same people all the time. Some are more lenient, and other are more strict. No one has a good barometer for this. A lot of my stance when helping these guys out has been to look at things carefully and objectively, and not to make the same mistakes as people who I often downvote/close. This has helped, but I'm not confident that the community is tolerant of a few mistakes. This can sap a new user's confidence straight away; if they're going to be penalized for a few mistakes, why would they bother if they can keep hitting Google for other resources? I have the same experience (only account around me), and for a long time didn't have an account myself. I wanted to comment on other peoples questions (partially because I didn't "get" the whole system yet). This affects us getting valuable users (the "experts") because they are really good at research, and so don't ever need to ask a question. We are victims of our own success here, we are so good at curating knowledge that they can find it! Which was the point, but it makes an account far less valuable. As to the second motivation, you have to want to participate in the site for it to be a motivating factor. Most don't, they just want their answers (again, this is disproportionately true for expert users). Can we fix it? I don't see any way to under the current system. Even now that I've grown quite fond of just using Google or Twitter to register, the process of figuring out what I'm actually allowing something I just met to do with those services is usually sufficient for me to pass on registration. People don't know we're not evil because all the evil sites run around saying (wait for it) .. WE'RE NOT EVIL! Entice the user by showing them what they can gain. Come, join us, help us accomplish small units of work in order to make life better for every developer in the world does go a long way, but that makes the assumption that everyone has that kind of time. You hit the site, you find your answer, and you go back to furiously fiddling with things in your editor to the tune of that grinding sound of a deadline drowning out everything else. The way to get more is to do more stuff that encourages long-term orientation starting at the first interaction (which is a page view by someone we don't know). Then you have to figure out how to not be annoying as you do that. We've got some folks set to tackle that problem, and more when it comes to the experience that new users have in general - that's going to be the only thing they care about for quite a while. I'm really excited about it, because it's a very interesting and difficult problem to chew on. Well, it's not really a problem in a practical sense, but we feel like we should be doing much better in that area, so that's what we're endeavoring to do. I can't log in at work as my network access to Google login is blocked. I can get Stack Overflow though, so during my workday it's read-only. Also as a relative newcomer it can be quite difficult to not get a shed ton of negative reputation points for asking a duplicate question or making a simple mistake. There is a high tendency to bite the newcomers as Wikipedia phrases it. In my opinion, skilled developers don't sign up because they already get a lot of benefit out of Stack Overflow, and they don't think the reward/effort ratio is high enough to contribute. Showing off my skills and perhaps getting a job. This never actually happened. I have posted questions, and I have had them answered. This is by far the biggest benefit, and you need 0 reputation points to begin doing it. Several times, I have used my favourite search engine to look for an answer to a question, only to find that I had already answered it on Stack Overflow. It turns out, making notes in public where Google can search it comes back to reward me in the future. Answering requires 0 reputation points, so you can start investing in this immediately. Similarly, I have come across answers that I have already upvoted. This saves me the trouble of re-reading all the answers if I know which one I found best last time. You only need 200 reputation points before you can upvote questions everywhere, even on Stack Exchange sites other than Stack Overflow. Again similarly, I have come my own comments that turned out to be useful to me later on. Again, you only need 200 reputation points before being able to do this on all sites. My wrong answers get corrected, for free. My mediocre answers get improved, for free. Basically, Stack Overflow is like my personal list of notes about technology I'm learning, except Google can search these notes, and I have a huge community helping me to improve them. The reputation system makes the bar look a lot higher than it is. In reality, you only need 200 reputation points before unlocking 100% of the useful privileges on all Stack Exchange sites. You don't need to compete with the top 1%. Here's how to get to 200 rep: just post questions that are selfishly useful, and post answers that are selfishly useful. In a few months, you'll have gathered 20 upvotes, and since you're only posting selfishly, you'll be reaping benefits even before that point. Be pragmatic and don't join the race unless you find it fun. As Servy said, "Because most of them never need to." Why people would like to sign up? The first two cases could be expected later, when people would like to feel more involved in the community. The last two cases are, in my opinion, more suitable for newcomers at first. To ask new questions or give new answers, it is needed just to sign in, so 1 reputation point is enough to create posts. Suggest an edit, 1 reputation is enough in our model, but it requires much more effort to do it well enough to avoid rejections than just a comment. I know why the system is currently this way. I'm not questioning if it is OK so or if it should be another way. Q- Why don't people sign up and contribute? Otherwise, we could think about the body of your question. I am the only person I personally know who even has an account. Why is that? Why do so many people not consider signing up, let alone contributing? 1 - I don't bother, my time is precious. 4 - I don't feel myself confident enough to ask/answer in English. 8 - I scare of being ashamed if somebody search and find me with low reputation or even worse if I make a big mistake. I ask myself: Did I scare to participate even if I was using Stack Overflow for long to get answers? My answer is: Yes, I love user-content driven sites, but also I refrained to participate due to the possibility of being ashamed by my workmates/friends if I failed to do the right things at the start; the reputation system was the main reason, in the same way as I almost do not use any social network: everything you write (in public) is kept forever (for glory or shame). Q- Do other people find the same level of apathy amongst your co-workers? A- I find the same level of refraining, but I think it is not apathy. What are we doing wrong, or not doing? Or is this just "the way people are"? I would add: Could something different be done to encourage more participation? First, we need to know a bit about how this site is working now, by studying the participation levels. I'm searching for a recent answer in meta with graphics and data on the subject, but I cannot find it now. I'll retry later, but for now this is what I remind: most users keep with 1 reputation forever, and a very low amount of users contributes a lot. This phenomenon is known as participation inequality, with just very low amount of users accounting for most the action while a very high amount of users never or rarely contribute. There are a lot of articles about the subject, but I would like to chose an old article by Jacob Nielsen, The 90-9-1 Rule for Participation Inequality in Social Media and Online Communities. In the last paragraph How to Overcome Participation Inequality, he answer You can't, but I find useful the choice about how you shape the inequality curve's angle. Make it easier to contribute. Make participation a side effect. Encourage more to improve (editing) over creating. Make it easier to contribute. An unregistered user already gets a good popup when trying to upvote or comment. There could be added a link to Why should I create an account?, or even the full text (it is short). Also maybe something like How to Say Thanks in an Answer should be clear enough for newcomers. And it could be easy to oversee that you can post answers being unregistered and hard to understand why not ask for clarification on existing answers If it is a registered user asking a question, a better template could be handy. See Could some bad questions be avoided with additional prompting?. For an already experienced user, make it easier to find interesting questions to answer, (not everybody handles the SEDE well). Encourage to improve (editing) over creating. I know in our model it is encouraged to edit (see What kind of behavior is expected of users? ), and we already have got some good improvements to avoid duplicated questions, like this popup when asking, but there is still some room for improvements. I mean to improve the usability of canonical questions: The Wikipedia of Long Tail Programming Questions. Duplicates and related questions should easily find a place in canonical questions, but I find difficult to learn about that feature on Stack Overflow. Related: How to handle questions whose root cause is an already well-answered issue?. Rethink the reputation system. Besides the possible effect of potential users refraining to sign up, I think a more complex reputation system is needed, not just as it is now. I think the current reputation system is not too bad, but it is far from perfect. But this could be a subject for another debate (too broad to include it here). However, I want to include at least two thoughts. Once burned, twice shy. If the system has treated you poorly (even if you deserved it), then why should you help? I find Makoto's suggestion interesting: Question Forgiveness and Why is Stack Overflow so negative of late?. Even with some high reputation some users have a feeling on the system encouraging to game it. See Michael Richter's article on gaming Stack Overflow's reputation: Why I no longer contribute to Stack Overflow? Participation can also be a side effect. There are a lot ways to achieve this, and there are some interesting suggestions on meta. A “friends list” on Stack Overflow would be nice. RSS makes it easy to follow a few, not a bunch; however for now Stack Overflow is not a social network. Related could be Show off the posts I'm most proud of, or another suggestion I cannot find now about high reputation points users allowed to show others (mark) interesting questions and answers. I would add: Users should be able to recommend other similar/related questions that also helped them for this question. These links' visibility should be prominent. But again, I'm not trying here to debate on new features; just thinking loud about what could be done. A2- The advantages of the current system do not compensate the amount of people not signing up. I don't think Stack Overflow is doing anything particularly "wrong." Nothing is perfect and I'm sure there are improvements that may foster more participation. However, there are some fundamental points that I think might possibly perchance in some conceivable way be influencing a developer's decision on whether or not to sign-up. Developers are inherently antisocial. I was discussing this with a colleague just the other day. Most developers I know (and I know several hundred) are very picky about who they talk with and socialize with. They like hanging out with friends, but they don't like the idea of communicating with people they don't know. My theory is that it's a conditioned response from having grown up thinking in first-order boolean logic. It makes us hard to relate to for most people. "But that's not what you said," should probably be carved on every developers' headstone from constantly picking apart the ambiguous statements everyone else constantly uses to communicate with. Developers value their time more than McMillon values money. At work, we're pressed for time in a big way. At home, we typically are tinkerers -- always wanting to create some program, robot or death ray. Or we want to challenge our brains with the latest video game. Something, anything, other than signing up to tell people over and over, "Post your code and then tell us what you are really trying to do." It's not that developers don't want to be helpful -- we do. We just don't want to feel like we're wasting our time on morons when we could be doing something far more interesting like solving the world's energy crisis, or helping others forget their worthless existence by making the next Angry Birds. I realize these are generalizations. But based on my experience, they hold true for most (not all) developers. Just an example to confirm Servy's answer. I had used Stack Overflow for a long time just as a reader without an account. Because I used Google as the primary source of information, and soon found that Wikipedia and Stack Overflow both contained high-quality articles, Stack Overflow was being my reference as a Q&A site. And one day, the proposed solution was not enough for my requirements (was about Dojo Toolkit). After digging in reference material and days of tries, I found a solution that was better for me. As I thought it could be useful for others, I decided to create an account and post it. Then, as I had received a lot of help from Stack Overflow, and as I had an account, I then begun give back help to other Stack Overflow users by answering questions. But without that first post on a detailed problem on Dojo Toolkit, I should not have an account today. You specifically mention the workplace in your question. Plus, "how about a few answers too now and again to 'put back' what you get"
I'd like to point out that getting the information that you need to do your job is what you get paid for. On the contrary, helping others with their problems outside the company is not what you get paid for. If you cannot come up with a reason, your boss might be inclined to ask why you are not using other resources to solve your problem, that do not demand you to "put back" anything. Personally, I created an account (not this one) for work, but I am only asking questions there and am not answering other questions. I did this because I was under the impression that you have to provide an email address anyway, even as a guest user. I decided to create a regular account, which I can justify as it helps me getting answers to my questions, whereas I could not justify answering other questions. I feel the sign up aspect has been covered in other answers, but let me take a new look at contribute, from my own perspective. When I first signed up with Stack Overflow, it was for my own needs. I didn't care about helping the site, I cared about the site helping me. For a bit, the site was this cool new thing for me, like many things in my life are. Then I discovered this site was just one of many- This site was what I needed for work, but there were sites I could enjoy for my personal life as well, such as Arqade. Now my history on Arqade is far different than my history on Stack Overflow. When I created an account on Arqade, it wasn't to help myself. Indeed, I have asked zero questions over there- When it comes to gaming, I can usually find the answer or figure it out myself simply because I have far more experience in it than in programming. So instead of wanting to help myself, finding this site that focused on something I was interested in and not just something that I (at the time) was only interested in for work really made me rethink the Stack Exchange network as a whole. Though I'm currently not active on Arqade, due to a lack of time to game and a lack of time, at home, to access the site really, Arqade made me realize how important these sites all were, and how much work we should be doing to help take care of them. Since then, my focus when I come to Stack Overflow, or, more often, Meta Stack Overflow, has been "What can I do to help improve the site? What can I learn more to keep myself from hindering the site?" While I don't feel I can really answer many programming questions, I've become decently active on Meta. Through participating here, I'm learning how better to contribute to the site, both to help me and the other users who find things I've done. How does this answer why people don't contribute? Well, at least for some people, it's because they don't care to. Stack Overflow, to them, is just a means to an end. It's a site to get an answer to that small issue that's holding up their project. To them, the site is not "their community" like it is for some of us here on Meta. They don't see how important this site really is, and for a number of people like this, they likely never will. But for some, when they realize there's more to the network than just Stack Overflow, they may dig deeper and see there's more to Stack Overflow, and Stack Exchange as a whole, then just "Ask question, get answer, don't care about anyone else." As a side note, one of my coworkers had no interest in the Stack Exchange network, creating an account that is, until I told him about the plethora of other sites with other topics. While he still might not ever create a Stack Overflow account, he may just decide to join up on one of the smaller sites that interests him, so that is always a step in the right direction. I rarely have a need to ask a question on Stack Overflow because I usually find the question has been asked already, or since I'm a proficient programmer the random hints I find on related questions are more than enough to help me solve my query. Often however, I have a useful comment on an answer that I'm unable to contribute because I have less than 50 reputation. So why not answer a few questions to earn that 50 reputation? Well, there is rarely a question I find particularly worth bothering to answer. If it was worth bothering to answer it would probably require a fair bit of research to meet my own personal standards. But most stuff of the unanswered/new questions I find are "homework" style questions, or very specific one-off questions that probably have little use to anyone else but the original poster. In addition, any attempt to write an answer to these questions I usually find somebody else gets there first, usually someone with a huge reputation score, and probably a lot more time on their hands than me. What's the point? "I'm wondering why people don't get a little rep (15) to be able to upvote to give a stronger indicator of which answer works plus as a thanks to the posters - to "give back" to the site." Because "get a little rep (15)" actually takes quite a bit of effort. You can't just sign up and upvote - even if you really want to. I get that there are (probably good) reasons for that. But it also puts a big barrier in the way of contribution. And if you don't have any rep and want to upvote something, there's actually nothing you can do immediately to change that. So not only is there an effort barrier, but investment is required. I need to invest time now, in the hope that in the future that investment will be rewarded to the extent that I can upvote. And I know that when that happens the Q/A I wanted to upvote will likely be long forgotten. That's quite a lot to ask, when all I want to do is say "thanks" or "nice one". The investment I make in signing up is decoupled from the "reward" I want: the ability to upvote. At first I didn't even think about it. That's just that simple. You know, I do a lot of searches, and I don't always sign up on whatever website/forum/board I find the answer I was looking for. What made me sign up to Stack Overflow is that I eventually ended up here 80% of the time (20 are Linux-related questions to which finding the answer is easily done, because it has great official documentation). I didn't think I was able to contribute (and still feel a little that way). Let's face it, except if you're super fast or just hitting F5 on newest questions, you can't really answer easy questions because someone already did it five seconds earlier. And not being able to answer easy questions leaves you with unanswered ones (hard ones) and those are the ones I'm afraid I can't really help with. I didn't feel like signing up just to upvote at first. And when I did, I noticed I had to earn reputation by.... answering questions. I know there's asking too, but 99.9% of the questions I'm asking myself already are answered here (one way or another) and that's precisely why I come to Stack Overflow. Because answers are here. Just my two cents, hoping it can help you understand one's reasons. For the past 6-7 years I've been exactly like the people described above. I have used stack overflow, found the answer to hundreds and hundreds of questions, and been a huge fan but I've always just taken the answer and run with it as a guest/lurker. Why did I finally sign up? I found the answer to such an obscure programming question that had zero votes. I felt obligated to sign in and thank the answer giver with an upvote and possibly a thank you comment so that others would know the answer was valid. Fastforward several months to now and I have now just enough reputation to make this post. I've been unable to upvote answers to my questions that helped or solved my issue, and I believe the community suffers from it. It might not be a solution to get people to sign up for stack overflow, but I think the community needs to consider a better way to retain the users when they do sign up. Gamification doesn't appeal to everybody. Some just want the practical benefits that don't need an account. I won't remark on the general case as I think existing answers cover it fairly well. The organization I work for has a large number of engineers working for them (on the order of 10k+). Historically developers here didn't have access to the Internet, let alone anything as valuable as Stack Exchange sites. As a consequence, most "good practices" (::cough::) came from books written in the 1980/1990s or word-of-mouth, etc. Not long after Stack Exchange sites became a usable resource for us, a variety of things (including intentional or incompetent network policies) have rendered many websites mostly or entirely useless (for example, only able to browse a given site). It seems that when someone doesn't know how to make stuff work correctly, their solution to making it safe/secure is to render it useless. I'm trying to change the developer culture within our group (for example, getting people to read books like Code Complete, doing regular training on technical topics, encourage developers to become regular contributors to Stack Exchange sites, etc. ), but this is just one of the many stumbling stones we've hit along that path. Supposing these problems were magically resolved overnight I wouldn't expect an influx of new accounts/contributors from our organization (whether because they expect stuff to be broken, or they're conditioned to lurking). Nevertheless, it's an answer to your question. People don't sign up because they don't care about maintaining their record. When they have a question that needs to be answered and they can't find the solution with search option they will ask, get an answer and leave till the next time. It's the same thing as for example if you are looking to identify a song. You might ask 1, 2, 5, or 10 requests for identification in a music forum, but you wouldn't really care how the users there rate you or if thous four questions will be related to an account or not. It's better that sites will encourage the first type rather than the second type. Sites like Mailinator.com were invented because of the second type. They allow a fast "Register and Forget" method. Some people don't know how to ask. If they get any issue, they will search through a search engine. They will apply the solution if they got any. If they don't get any solution or are not solving it with the available solution, they will change the problem (will use another method/technique/library). So they won't ask any question. Personally, I find the upvoting / downvoting system to be really frustrating. I signed up, but I've stopped asking questions because my questions would get downvoting with absolutely no commentary as to why. Which is silly and pointless -- it's a system where the "in" crowd can play their little points game, but those on the outside find frustration in guessing what gets a downvote and what doesn't. I even tried emailing the site admins and still got nowhere. So I've given up trying to be a contributor on this site and am happily lurking. In my opinion, if you want more contributors, you need to make the point system more transparent and less subjective. Downvotes should be treated as another way to help someone, not as a method for excluding people who are just trying to contribute. They went and moved my very pertinent to the question comment to "chat." And they did so by gutting the comment and only copying over one part of it, and displaying that out of context. Behavior that reenforces my comment, and reveals that no one on SO/SE is truly interested in addressing any of the issues that are undermining it. LOL and sad. Just discovered that, after posting my comment on on the original question, someone went and downloaded several of my questions. Just more proof of what I state--Mean and nasty is why people are shying away from creating accounts on SO and SE. The behavior of the moderators are the biggest deterrent to those possibly interested in opening an account, and maybe even later contributing. I know several people that have signed up, asked a question, and then were pounced upon by the moderators. After two or three times of that, they just bail. I have started seeing blogs and other comments on the Internet lamenting the behavior of the moderators on Stack Exchange/Stack Overflow as well. A friend of mine started using Stack Overflow as he began to teach himself Python. He made the mistake of responding to the moderators' questions thinking they had his best interest in mind. Boy was he wrong about that. He was more and more targeted each time he asked a question. Then he tried to contribute by answering a question, and then the very next question he asked was attacked so fiercely it was almost funny. One moderator marked it as a duplicate, even though the supposed original question had nothing to do with my friend's question. Then my friend made the mistake of pointing that fact out. The next time he tried to ask a question, he found a warning that he was "In danger of being banned from asking questions." He logged out and has never logged back in again. Just as he had develop enough knowledge, and felt an obligation, to contribute himself, he was prevented from doing so by self-righteous and self-serving moderators. A real shame. People see the nastiness when using the site, and they discuss it with each other as well, and the result is to turn many away. Not the answer you're looking for? Browse other questions tagged discussion new-users sign-up . How much research effort is expected of Stack Overflow users? Can we make this meta site work for mentoring? What makes you guys improve this board so much? How to handle questions whose root cause is an already well-answered issue? Was I too harsh when handling a newbie question? Should I say please when asking an OP to post more information such as code or logs? 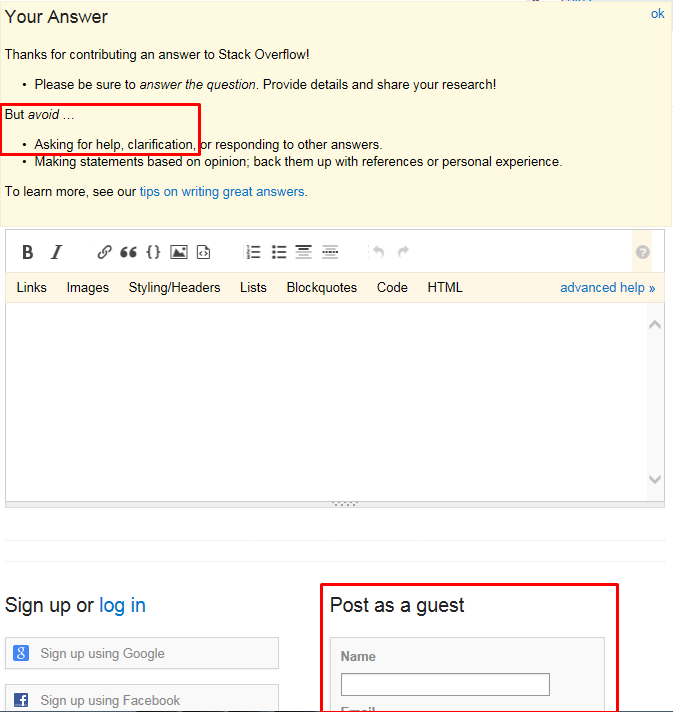 How do I contribute to Stack Overflow?